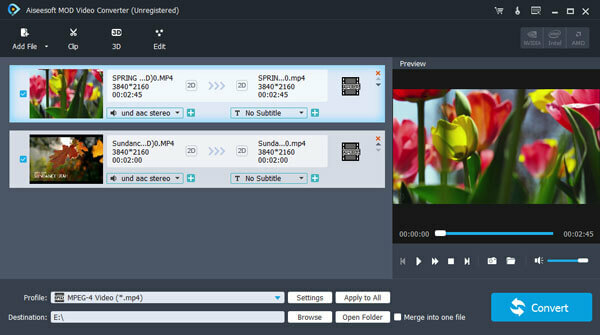 Aiseesoft Mod Video Converter 7.1.28 無料ダウンロード - Convert Mod and other popular video/audio files to any video and audio format. Aiseesoft Mod Video Converter is a professional MOD Converter used to convert MOD/TOD video and other popular video/audio files to any video(AMV, ASF, AVI, DivX, Flash H264, FLV, SWF, H.264 AVI, H.264/MPEG-4, MKV, DV, MOV, M4V MPEG-4, MPEG-1, MPEG-2, MPEG-4, MTV, VOB, WMV, XviD, VCD, WebM, HD video) and audio(AAC, AC3, AMR, M4A, MKA, MP2, AU, MP3, AIFF, OGG, FLAC, WAV, WMA) format. Moreover, it will bring you much faster converting speed with AMD APP and NVIDIA CUDA technolog, and it supports the popular iPhone 5s/5c, iPad Air, iPad mini 2 and Samsung Galaxy Note 3, etc. The output files can be played on iPhone 5s/5c, iPhone 5, iPad Air, iPad mini 2, iPad 4, iPad mini, Samsung Galaxy Note 3, Kindle Fire HD and HTC One X, etc.